The city de Lima, founded by Francisco Pizarro on January 18, 1535, was considered the vice-royal capital de South America for three centuries. After Pizarro’s decision to make Lima the capital de his government, different Hispanic authorities established their residence in the city. Its official name was Ciudad de los Reyes (City de Kings), although after a while, people preferred to call it Lima. For some researchers, the name Lima is a transformation de the name de the river on which it was founded, Rimac. Others instead suggest that the name was the old word for the lands de Taulichusco, the lord who ruled the valley when the Spanish arrived. 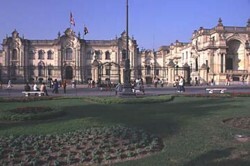 In 1821, Lima became the capital de independent Peru. During the first decades de Republican life, it was the scene de political fights among different leaders. The advent de the twentieth century implied a renovation since the city modernized and grew in the attempt de trying to keep up with other great capitals de the world. In 2002, the Department de Lima was divided into the Departament de Lima and Metropolitan Lima, the capital de the country.